This is not a how to post on choosing color in the usual sense. There is a lot of information available about color choosing. For example, how to be aware of the undertones of colors – even neutral colors have an undertone and those with blue undertones don’t play well with those that have yellow undertones. Color undertones of the things you cannot change, such as flooring or granite countertops or trim, will limit your choices. (Maria Killam, interior designer and colour expert, does an excellent job of explaining undertones on her blog ,Colour Me Happy.) You can find out about monochromatic color schemes where a single color is represented by different shades and values. Or complementary colors where opposite sides of the color wheel come into play, like orange and blue. 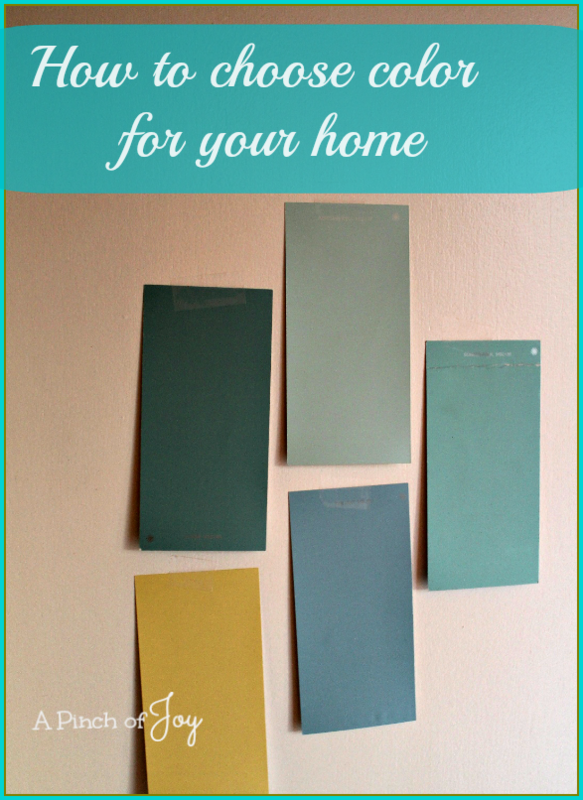 Or colors that are trending and therefore will keep you ahead of the Joneses and make your house sell instantly. And we’ve all heard the advice on keeping bland backgrounds so “everything will go with everything else.” No, this post is about how to choose color at the most basic level. Color affects us all profoundly. The colors we choose to use in our homes have a play on our moods, our productivity and quality of life. Most of us know that we are attracted to certain colors more than others. Even little children can tell you their favorite color without hesitation. Oftentimes these colors are those that complement our own coloring and personalities. Some people do not need a lot of stimulation and truly are happier in surroundings that are neutral with little variants. Other people would be terribly unhappy unless they are surrounded by color, whether pale pastels or rich jewel tones. This post is about paying attention to those signals about color that we know intuitively. And not being afraid to act on those signals. You see, we have a central powder room on the first floor. Central meaning there are no windows. And that the living room is on the other side. And the office and kitchen are just steps away. That it is quite small. Think standing in the middle with arms held at shoulder height and bent at the elbows. Your elbows will touch the side walls. Make a quarter turn and straighten those arms. Your fingers will touch the end walls. Yeah, that small. It was a garish bright yellow when we moved in and we covered it with a soothing buttery yellow wallpaper with a small gray,soft green and peachy design. And liked it, but it began to cry for renewal. And we were in a different time and place in our lives so renewal was good. I eagerly set out to gather paint samples and taped them to the wall. Dozens were eliminated. Wheels didn’t like those and I didn’t like another bunch. Slowly we began to realize a pattern. We were drawn to the bold this time around. Since we were planning to repaint the entire house over a period of time we began to think about how this would fit in and what direction to take. We were thinking that this small bathroom would be a good place to experiment. And yes, we knew about pale colors making small spaces seem larger – but still the bold ones kept coming back. The paint samples had dwindled to ones very similar to those above. They were taped to the bathroom wall. Next morning, I took another look. An Easter egg factory. I didn’t want people to think they were in an Easter egg factory. Maybe it was too much color. And I began to agonize. We already had kind of decided which color we agreed upon but maybe it was too much. So I didn’t do anything for a year. For a WHOLE year. But the weary wallpaper stopped crying for renewal and began to beg in flaking bits. This post is not about my friend and her reaction. She’s fun and funny and has been through enough in her life to know what matters and it is not drama for drama’s sake. She is honest about things that matter. No, it’s about my reaction to her reaction. We lead very different lives. And what she saw as fun and maybe frivolous and way too much for her tastes suited us. Because when I dug the paint swatches out of the drawer and added more, both Wheels and I immediately gravitated to the strong and bold. Through a process of elimination we ended up with the very same ones we had before and one in particular kept rising to the top. The one we both really liked the first time. It was not a color we would have ever considered at previous times in our lives. And we were both surprised at how it spoke to us. And so we finally painted the bathroom that color. And love it! Never once have I thought about Easter eggs when I walk in there. We loved the color so much that we painted the dining room a lighter shade of the same color. And love it! How to choose color for your home? Note what things cannot be changed in your home. For us it was the wood flooring — everything else was free game for change. Know that you will work within whatever limits that might impose. Then you pay attention to the things that matter to you and those with whom you share your space. Finally, have the courage and conviction to follow through on your decision. You’ll love it! Check back to see what color we chose and how it all turned out! I’m so glad you stopped by today! Be sure to follow A Pinch of Joy so you don’t miss a thing! I’d love to have your company on this venture!! Subscribe: email on the sidebar or follow on Facebook / RSS feed / bloglovin’ / twitter and check out my pinterest boards. Share: if you found this helpful or inspiring please click one of the buttons below! Your support of A Pinch of Joy is appreciated! Hello! Loved this post! I’ve read so many posts about how to choose colors and this one is different and really helped! Just wanted you to know that you’re being featured on the Weekend Wind Down Party this Friday night! Thanks for linking up! Isn’t it sad how often we doubt ourselves and have to think about what every one else thinks about our decision? I have that happen to me time and time again. I’m terrible about not letting others influence me. Good for you in listening to yourself and enjoying what you wanted! I’m glad that you like your colors and can’t wait to go see what the end result looks like. Thanks for sharing with us at Shindig Saturday. I look forward to more great ideas from you. You are so right that everyone has an opinion on color! But since I went ahead and used the color we chose for the bathroom, I’ve had only positive comments. And everyone LOVES the dining room with its similar color. Thank you, as I am looking to find a nice new color for our bedroom. Thanks for sharing and linking up with us at the #WWDParty. I hope you are having a nice weekend. I have the hardest time deciding on a color scheme. I’m attracted to the calming aspects of greens and blues, but I really love purple and gray combinations. I would be happy with a very colorful home, as long a it’s inviting. Thank you for the Sits ♡♥ Have a great week!